The BBC's Malcolm Brabant looks at why student anger erupted across Greece over the fatal police shooting of a teenage boy. 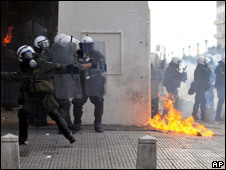 The riots that swept Greece underline why the most important day in the national calendar is "Oxi" or "No" day. "Oxi" day commemorates 28 October 1940, when Greek leader Ioannis Metaxas used that single word to reply to Mussolini's ultimatum to allow Italy to invade Greece, propelling his nation into World War II. They may be the iPod generation, but they are the inheritors of a tradition that goes back centuries, when nuns would rather hurl themselves to death from mountain convents than submit to the ravages of Greece's Turkish Ottoman invaders. The centre for this December rebellion is the Athens Polytechnic, where students have been out on the streets with wheelbarrows and shopping trolleys to collect and recycle rocks and pieces of marble used in the previous night's assaults. The polytechnic is the symbol of modern rebellion. On 17 November 1973, tanks of the then six-year-old military dictatorship burst through the iron railings to suppress a student uprising against the colonels. The exact casualty figure is still unknown to this day but it is believed that around 40 people were killed. The sacrifice of the polytechnic was so significant that the post-junta architects of Greece's new constitution drafted the right of asylum, which bans the authorities from entering the grounds of schools and universities. Although many of today's protestors were not born when the polytechnic gates were crushed by the tanks, the lesson of the students' martyrdom is a key component of every Greek child's school democracy curriculum. The death of 15-year-old Alexandros Grigoropoulos at the hands of an experienced 37-year-old policeman has precipitated a wave of nationwide violence unseen since the dictatorship. Whether it will lead to the fall of the unpopular conservative government of Prime Minister Kostas Karamanlis is unclear. 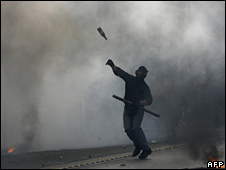 It is premature to see the troubles as Greece's reprise of the Paris uprising of 1968. One of the wisest observations has come from Nikos Konstandaras, the managing editor of Kathimerini, one of Greece's more sober and respected newspapers.